* Denguélé d’Odienné is from Denguélé in the northwestern part of the country. The modest club is currently number 4 in “Poule B”. Attackers Zoumana Koné (born 27.10.1991) and Boukari Ousmane Abdoulaye from Niger are star players, together with veteran goalkeeper Missa Noël Tanoh (born 25.12.1974) and defender Kaloulou Sylla (born 01.11.1987). Wingers Mohamed Lamine Comara (born 07.08.1991) and Gouantohou Kaplaka (born 02.03.1990) was brought in from Africa Sports and ASEC Mimosas, respectively. * Newly promoted Ecole de Football Yeo Martial, fondly referred to as EFYM, is surprisingly number 2 in “Poule A”. Unfortunately, it is rather difficult to find information about the Abidjan-based side. According to Fédération Ivoirienne de Football, star striker Moryké Fofana (born 23.11.1991) has scored seven goals so far this season. Other key players include goalkeeper Mohamed Kotoko, Fortune Joseph Allangba Brou (born 13.06.1986), Dosso Gouaméné, both former players of SO Armée, attacker Roméo Zahouo Bi, often the captain of the team, and Franck Stephane Mapé (born 24.12.1992). * Issia Wazi FC, from the inland city of Issia, is currently rock bottom in “Poule A”. However, when the club signed lively striker Koffi Davy Bouah (born 20.09.1986) from ASEC Mimosas in April, things have looked brighter. Bouah, who failed to break through at ASEC, has scored four times since joining Issia Wazi FC. Kassim Koné (born 11.12.1982), another former player of ASEC, is first choice goalkeeper. Banou Diawara is an interesting striker from Burkina Faso. * I think Jeunesse Club d’Abidjan looks good this season, currently ranked as number three in “Poule B”. Abdoul Karim Ouattara and Dely Roland Sadia are both experienced goalkeepers. Hamadou Konaté (born 07.02.1983), the former captain of USC Bassam, and Yao Olivier Kouakou (born 11.01.1986), are rock solid defenders. Rouxel Franck Derou (born 20.10.1988) is a great signing from Africa Sports, playing in defensive midfield. Nigerian midfielder Michael Ogundina (born 06.07.1984) has been a key player for more than six seasons. Bommanin Peggy Kohouo, formerly of Africa Sports FC, has been a revelation up front. Kohouo is often playing together with Ya Thomas Ronardo Gonazo Bi (born 30.12.1990). Experienced strikers Mihan Bosson (born 20.02.1987) and Armand Boly (born 18.11.1975) are great players to have in the squad. * ASC Ouragahio, currently rock bottom in “Poule B”, is from the inland city of Ouragahio. Romuald Kouadio Akissé and Mohamed Siby (born 19.11.1987) shares the goalkeeping responsibilities. Jean Serge Sery Dogo (born 01.02.1981) is the captain of the team and a key player in ASCO’s attacking play. He is sometimes partnered with veteran striker Michel Zate Kagba (born 20.12.1981). * Séwé Sport, based in San Pédro, the port city in the southwestern parts of the country, is currently leading “Poule A”, five points before EFYM. Goalkeeper Guelassiognon Sylvain Gbohouo has been brilliant. Kouadio Yobouet (born 25.12.1988), Mahan Marc Goua (born 02.11.1989) and talented youngster Ousmane Adama Ouattara (born 22.12.1993) are important for the impressive defensive record of the team. The creative Kabran Stevens Koffi Foba (born 12.08.1989) and the consistent Souleymane Dembélé runs the midfield. Séwé has sone of the most interesting attackers in the league, including Roger Assalé (born 13.11.1993), Mandela Ocansey (born 02.02.1990) from Burkina Faso and petit striker Koelly Kevin Zougoula (born 20.03.1984). * Stella Club d’Adjamé, based in Abidjan, has been one of the disappointments of the season, currently number 5 in “Poule A”. However, there are several quality players in the squad. Vagne Kobenan and Christophe Aifimi are good goalkeepers. Tiécoura Coulibaly (born 04.05.1988) is arguably the best left-back in the league. Ever-green Jean-Baptiste Oulaï is leading the defence together with Dape Marius Gnabouyou (born 08.12.1988). Fousseny Coulibaly (born in 1990) is a tall, hard-working holding midfielder, usually fighting side by side with Mohamed Kaba. 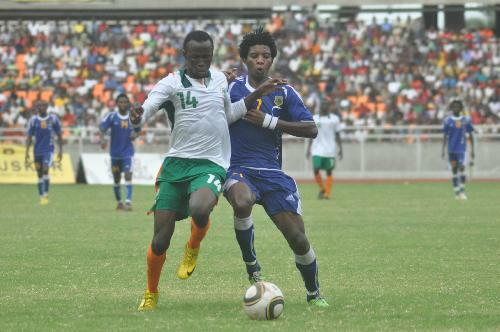 Newly signed midfielder Daniel Akuffo (born 05.05.1990) has made a bright start to his career in Ivorian football. Experienced right-winger Raphaël Yabré from Burkina Faso has been performing well all season. Jacques Alain Tanoh (born 16.09.1987) has had a terrible season. The quick striker is usually a clinical finisher but he has yet to score this season. Strongman Koré Maixent Zagré (born 06.04.1986) has also been mostly shooting blanks. The picture is of Tiécoura Coulibaly and was found on mybestplay.com.